Just a quick post to let you know that my Dad is in the end stages and I will be absent for a little while. I hope I won't be away too long. Thank you so much for being so caring and for your prayers. Dad, Jack, and I appreciate them so very much. Over the weekend I finished working on the journal beginning for my doll 'Anneelaw', who will be visiting with six other artists before she finally returns home to me next May. I'm so excited about this because the format is quite different from Coolab2009 and I know it will challenge my creativity a lot. Go visit our Coolab blog to see the dolls as they progress and here to see my doll start. My journal was begun when I snooped through the male workshop domain and unearthed an old cigar box, which I covered with some recycled paper and a little stitching. I'm hoping the other artists will add to it too! There is lots of room in there for whatever might be added! Next came the first pages of the journal. I used watercolour paper as the base. Pages 1 and 4 were created using layers of fabric, fibres and various and assorted other 'bits' from my stash...layered between two pieces of Tyvek and then stitched using variagated thread. Then I ironed it (using parchment to protect the iron). Pages two and three began with a piece of recycled (and rusted) Swiffer cloth as a base, then a piece of painted (recycled) dryer sheet. A leftover piece of the front page was attached to the side and the poem I wrote was printed onto a piece of cardstock that had been 'aged' with gesso and newsprint. The newsprint was a 'nod' to the fact that when I took the lamp apart I discovered a sheet of newspaper had been stuffed in the bottom dated in the early 1970's - a fire hazard I would have thought!! If you'd like to read the poem (and it doesn't enlarge enough when you click on the photo) take a look on our blog where I've written it out. Update on Dad - We got through the weekend, but all he had to 'eat' was two meal replacement drinks each day. He's simply getting weaker and weaker. I have a call in to the doctor today and am waiting to hear back from her as to what the next step might be. I expect it will be some sort of feeding tube, but will have to wait and see. Thank you so much for your kind comments and prayers. They are appreciated more than you know. Craftbits is having a really fun giveaway that you are likely going to want to check out. The rules are simple - just decide on a Christmas gift you would really like to get (up to $150 US in value) and blog about it. Then link back to their site and you're entered. Their site has tons of Christmas ides for projects, cards, ornaments, wreaths and also things that kids can make - all are fairly cheap and use easily obtainable supplies (if you don't have them already. Go here to read all about it and to enter! I would absolutely love to own these - I would probably not knit with them and just keep them to fondle and admire!! Well, that's not true - I WOULD knit with them and would fondle and admire them the entire time. # 1 - KNITTING & BEADED CHRISTMAS ORNAMENTS - these look like they would be a great way to use up some stash! The pattern calls for a styrofoam ball, seed beads and pearl cotton thread. I would think you could simply use a larger foam ball, larger beads and yarn too. These look pretty simple and would make lovely gifts. #2 (and #3) - CHRISTMAS GUEST SOAPS - Another fun project for gift-giving or decorating your own bathroom at Christmas. You just need plain soap bars, some Christmas stickers, and some white glue - simple supplies. If you look under the CHRISTMAS GIFT SOAPS you will find instructions for how to wrap your decorated guest soaps for gift giving. Where, oh where, do you suppose the owner of these is? Did he fall in the rain barrel along with his shoes?? Here is just part of our butternut squash crop (we've given several away already, and eaten a few too). The green ones are a heritage variety that we thought we'd try out this year. Good thing we like squash!! Update on Dad - No supper for him last night. He tried to take the pill he was prescribed (for gas) and it refused to go down so that was the end of that. We thought perhaps he took it too close to attempting to eat so he tried another one this morning about half an hour before his breakfast. It sat (along with the sip of water) in his throat for at least half an hour before it finally dissipated. He has managed to get one of those liquid meal replacements down since, but there is no way he can even contemplate anything else no matter how liquid it is. Our next dilemma is how to get his pills down - the nurse this morning suggested grinding them up and putting them in some applesauce. We'll try that at supper and see what happens. Somehow I'm not holding out much hope for success with that either. And - calling the doctor this morning was a wasted effort. They don't have office hours on Fridays. Thank you all so very much for your comments and prayers for my Dad - I appreciate them so much, as does he. If you're still here, be warned that I've given you ample opportunity to bail out. Most of you are aware that we are caregivers for my almost 90 year old dad and have him in our home in order to do that. He has esophageal cancer and had a stent put in his throat last May in order to allow him to eat pureed foods and liquids. He has steadily been going downhill and currently only weighs 160 lbs. (down from just over 200 in May). All that is to be expected and is part of his disease. Last night I had to call the ambulance to take him to the local emergency dept. because he hadn't been able to get anything down for almost two days. When he arrived at the hospital, they, of course, ran bloodwork which showed that his blood level was extremely low. This was what they said the LAST time he was there but they didn't do anything about it then. This time they gave him three units of blood overnight. That was fine with me because it was obvious he needed it. This morning I received a call from the hospital that he was being released. I questioned that and was told that his blood level was now 'normal'. Well, that's good to know - BUT - what about not being able to eat, which is the reason he's there in the first place. Oh, said the nurse. We arrive (somewhat miffed) at the hospital and started asking questions. The emerg doctor told us that (get this!!) they had requested the local 'guy' who does throat scopes to have a look at dad and he refused. Ummmm....he refused??? Apparently dad is to see the dr. that put the stent in - but he's 40 miles away and dad can't get there without some sort of special transportation, so what do we do now??? Oh well, they sent him home with yet another prescription for 'gas' and we're now left twisting in the wind and dad still can't eat. Oh yeah, it's fun to get old. The 'rules' for the latest Art Doll Coolaberation include starting a doll using mixed media (which can include fabric) and not creating an entire doll base - for example, create a torso and head; or a torso and legs; or head and torso. The remaining body parts will be added (or not!) by the other participants in the group. Fun!!! This is definitely out of my comfort zone, but that's the purpose of this project (at least in my mind). The doll thus far has been created using parts from an old 70's era table lamp. The black at the bottom (legs???) was originally an ugly brass but a coat of black spray paint soon made that better - the middle part (torso??) is glass - also a piece of the lamp. I have spent the entire afternoon pondering ideas for the accompanying journal and hopefully I'll be able to work on that tomorrow. I have an idea in mind and just have to make it work!! If you're interested in seeing some more about this absolutely fun project go here and also think about following so you don't miss the updates as they happen! Val was interested in the flower trim I had used in my journal so I sent her some to play with. She has created her own using my originals as a prototype! I think hers are ever so much prettier than the commercially made ones I have. That lovely piece of rusted goodness behind is a piece of Tyvek she included for me to play with..BUT.....I just like looking at it and I know I'll have to force myself to use it! Thank you SO much Val!! Here's a closeup of the flowers so you can see more of the detail. Didn't she do great? 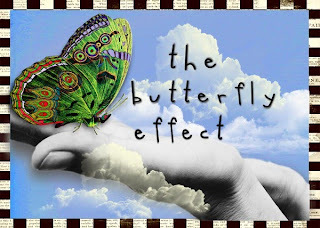 You can have a look at Val's blog here. My friend Irene made these quilt blocks with her handdrawn faces and was disposing of them at our last CQTeers meeting (disposing in the sense of hoping someone would wish to recycle them). I immediately knew what I wanted to do and absconded with them in a flash. I've been working with them this afternoon but unfortunately I can't show you what I'm doing until AFTER the next CQTeer meeting so Irene can see first. I'm taking part in another Art Doll Coolaberation!! I'm so excited and can't wait to begin playing with all the dolls. We all had so much fun last year and I must admit I was probably one of the ones that pleaded (pled? begged? whined?) the loudest to have another go! My doll is pretty much ready and I'll be showing pictures later - once I finish working on the journal start. You can follow our progress (and fun!!) here at the 2010 Art Doll Cool-aberation blog. 1. Tami of Lemon Tree Tales has two posts up on her blog showing some of the art dolls on display at the Petaluma Art of the Doll Exhibit. Go here and be sure to scroll down to see both posts. 2. I've seen this a few times now on various blogs I read and I decided to explore more thoroughly. The museum is planning an exhibition to be held in the spring of 2013 to honour the 1,500,000 (yes, you read that right) innocent children who perished in the Holocaust. They are hoping to collect 1.5 million handmade butterflies for the exhibition. More information can be found here, along with how you can donate one (or as many as you'd like). I simply cannot get my head around that many children losing their lives and I think this is a fantastic way to help to remember them. Won't you consider joining in? 1. Pam Kellogg has another in her series of posts dealing with depression up on her blog. I admire Pam so much for being so open about her experiences and know that these posts will be very helpful to anyone who has depression or has suffered from a breakdown. Pam did and talks quite candidly here. 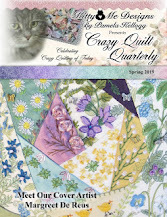 She has also posted some pretty incredible crazy quilt pieces throughout her post. Well worth a look!! 2. 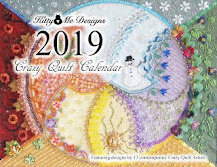 Further information on crazy quilting - I keep an eye on the Crazy Quilting International site and recently there was a full-of-eye-candy post combining crazy quilting and faces. This would definitely be of interest to those of us who enjoy doll making and/or CQ. Have a look here. Next up, is a report on the results of washing the walnut ink dyed fabrics from yesterday's post. Well, I'm happy to say that the colour did not change at all!! I was really afraid to put them through the washing machine and, being rather forgetful, I didn't remember to iron them first! Thought of it when they were part way through the wash cycle when it was a bit late!! I certainly wasn't looking forward to hauling them out of the machine, but they are fine. And, finally, here are a couple of pictures of the finished journal from my on line class with Carole. I'm really happy with it, even though I did get a bit carried away and made mine about three times as thick as it should have been!! Thank you Carole, so much, for this!! I would strongly recommend that if you're thinking about taking an online class, that one facilitated by Carole would be a great investment!! The piece below is also a piece of cotton - unsure of whether it has been washed. It also 'might' have a touch of poly in it. Finally, here is my favourite!! Again, it's cotton, but it's a piece I had rusted last year. I wasn't thrilled with the rust on it, so decided that adding some walnut goo wouldn't hurt it. It's hard for you to tell in the photo, but there are lovely variations of rust/dark brown/charcoal in it. As Arlee would say, 'yumth'!! Next step is to wash them all and see how much fading occurs. I'm almost afraid to for fear it all washes out! The walnut goo and remains are currently wrapped in yet another cloth, tied with string and residing in the middle of the flower bed until I can't stand it any more and HAVE to open it up. The 'plan' is for it to stay there til spring! Look what the cauldron has produced! A trip to the local cemetery yielded about two dozen black walnuts which, I'll have you know, was a definite skirmish with the squirrels who think they have exclusive rights. I thought they could share a few with me and not miss them. The trees there are huge and there are tons of walnuts falling to the ground right now. Five 250 ml jars of walnut ink!! and is stewing outside to see what happens. the local squirrels decide they LIKE cooked walnuts!! p.s. Considering the fact that at least five years ago I paid $7.50 for a mere 20 oz. of walnut ink, I think my 'experiment' was a rousing success!! while the kitchen timer was attached to my body. by the way, the photo shows the pristine fabric piece on the left and the end result on the right. I didn't take chemistry in school because I was in the commercial (secretarial) stream. For those of you who would like to create a similarly outstanding piece of fabric to use in your art, I will do a mini-tutorial here. 1. First you take a perfectly good piece of dupioni silk - mine was about 6" x 36". 2. Fill your kettle with 2 cups of water and plug it in. 3. While you are waiting for it to boil, place ten tea bags into a glass container. 4. Unplug boiling kettle, and pour water over tea bags. 5. Add perfectly good piece of dupioni silk. Are you following me so far? Any questions??? 6. Let stand two hours. 7. Remove perfectly good piece of dupioni silk from tea bath and wring out. 8. Take downstairs to laundry tub and pour bleach over it. 9. Stir to be sure it's mixed well. Still no questions? Are you sure??? 11. 20 minutes later remember perfectly good piece of dupioni silk in bleach bath. 12. Run to laundry room and rescue NOT so perfectly good piece of dupioni silk from bleach. 13. Rinse strenuously while watching perfectly NOT so good piece of dupioni silk turn into shreds. Please add a link in the comment section of this post to guide us to see what you do with this tutorial. These are a few of the pages I just finished creating for my on-line journal-making class. Thank you so much Carole for the class! !